Fluke experts: Capt. 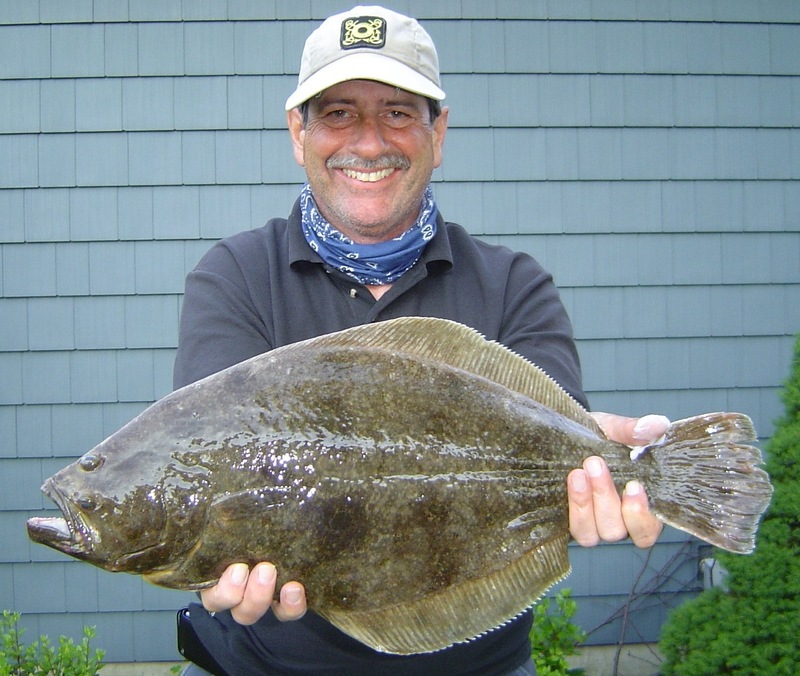 Dave Monti will present a seminar on fluke (summer flounder) fishing with interviews and tips from ten top fluke anglers, charter captains and fishing guides at the Saltwater Fishing Show this weekend at 2:30 p.m. on Friday and Saturday. Catch the Fishing Show this weekend: The New England Saltwater Fishing Show, the largest of its type in the Northeast, will have over three-hundred fishing related exhibitors. Captains from the National Geographic Network program Wicked Tuna will be there Saturday and Sunday. Captains from the National Geographic Channel program Wicked Tuna will be at the 10th Annual New England Saltwater Fishing Show this weekend at the RI Convention Center, Providence, RI. The New England Saltwater Fishing Show runs March 8-10 and is the largest saltwater fishing show in the Northeast. Sponsored by the Rhode Island Saltwater Anglers Association (RISAA), the 10th Annual Fishing Show will have over 300 exhibitors. You'll find everything at the show, including rods, reels, all types of lures, boats, kayaks, clothing and a wide assortment of marine related services. Many retailers will be offering low-priced show specials. Continual free seminars will be held every hour throughout the show. "Many of the top fishing experts in New England have offered their services," notes Ed Kearney, seminar chairman. “The topics include everything from inshore fishing to offshore fishing, as well as many seminars for the surf and shore angler.” said Kearney. Wicked Tuna captains from the fishing vessels Odysea, Christina and Bounty Hunter will be at the show from 1 to 4:00 p.m. on Saturday and Sunday. Show hours are Friday from 1:00 p.m. to 9:00 p.m., Saturday from 9:00 a.m. to 7:00 p.m. and Sunday from 10:00 a.m. to 5:00 p.m. Admission to the show is $10 for adults and children 12 and under are admitted free. Sunday is "Family Day"… all women and children are admitted free. For the youngsters, the show features a large “Kids Zone” with casting lessons and a number of games to keep them interested. There will also be a Scavenger Hunt on Sunday when all kids that enter will receive a Treasure Map in which they will receive small gifts at certain exhibitor booths throughout the show. 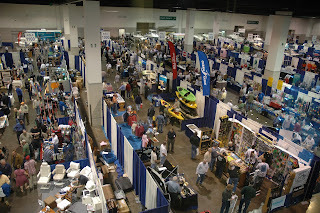 Visit the show website for more information and admission discount at www.nesaltwatershow.com . The sale starts at 9:00 a.m. and runs untill 2:00 p.m., according to Newell. Buyers gain entry to the sale with a $2 donation. Sellers must purchase tables from the club at $25 each, and should start setting up at 8:00 a.m. Cutoff date for buying tables is March 20. Sellers should call event chairman Dave Fewster for information at 401 230-8201. The East Bay Anglers is a 40 year old fishing organization which has promoted sportsmanship and conservation through the years and has participated in many marine conservation initiatives. Proceeds from the sale are used for educational purposes by funding speakers during the year. Checks for tables can be paid by mail to: East Bay Anglers Tackle Sale, Box 293, Barrington, RI 02806. Striped bass tolerate both salt and fresh water. They live in the ocean but spawn up rivers and many are landed lock, meaning they live in lakes. They are generally smaller in lakes, perhaps because their food supply is limited. Howeerver, a Dora, Alabama man, James R. Bramlett, 65 years old, landed a 70 pound striped bass from the Black Warrior River on February 28, 2013. Al.com reports the fish was weighed on certified scales with officials from the Alabama Department of Wildlife and Natural Resources at Bramlett's home. The fish was 45.5 inches long and had a 37.75 inch girth. The Department of Environmental Management (DEM) was awarded a $2.9 million grant today from the US Economic Development Administration (EDA) for infrastructure improvements at the Port of Galilee. The federal grant will support reconstruction of the 925-foot south bulkhead from Salty Brine State Beach to State Pier 3 and rehabilitation of 3,200 square feet of heavy duty work pier HH. The Port of Galilee is operated by DEM and is one of the largest working commercial fishing ports on the East Coast, providing fish, squid and lobster to both national and international markets. Home to over 240 commercial vessels, the Port includes 38 docks and piers and supports hundreds of small and medium-sized businesses, hundreds of jobs, and attracts thousands of tourists. Commerce includes fishing and related businesses, recreational charter and sightseeing boats, ferry service, restaurants, and a hotel. Recreational and commercial fishermen are urged to attend and express their thoughts on proposed amendments to a variety of management plans that regulate the length, catch limit and season of a variety of species. The Marine Fisheries Division of the Rhode Island Department of Environment Management (DEM) will hold a public hearing on Wednesday, March 13, 2013, 6:00 p.m. in the URI Graduate School of Oceanography, Corless Auditorium, South Ferry Road, Narragansett, RI. Important changes to recreational and commercial fishing management plans will be on the agenda including plan amendments for recreational summer flounder; recreational and commercial tautog; recreational scup; recreational black sea bass; Narragansett Bay Atlantic Menhaden; and amendments to statutes and regulations pertaining to fish/shellfish dealer regulations in regard to the reporting of research set aside (RSA) landings. Visit DEM’s web site at www.dem.ri.gov for additional information. Captain Andy Dangelo of the Seven B’s reported that the storm and rough seas over the past couple of weeks has kept the cod away and boats from sailing. However, Capt. 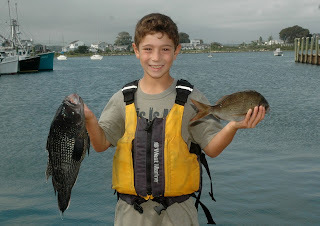 Dangelo said Sunday, “The bite was slow all day, we went south of Block Island, to Cox’s Ledge and nothing. Then we stopped back close to the Island and the fish finder was showing a lot of bait, likely herring. We ended up landing some nice cod right at the end of the day.” Overall cod fishing has been spotty. The hope is that the seas and fishing stabilize a bit now and the season closes with a rally. 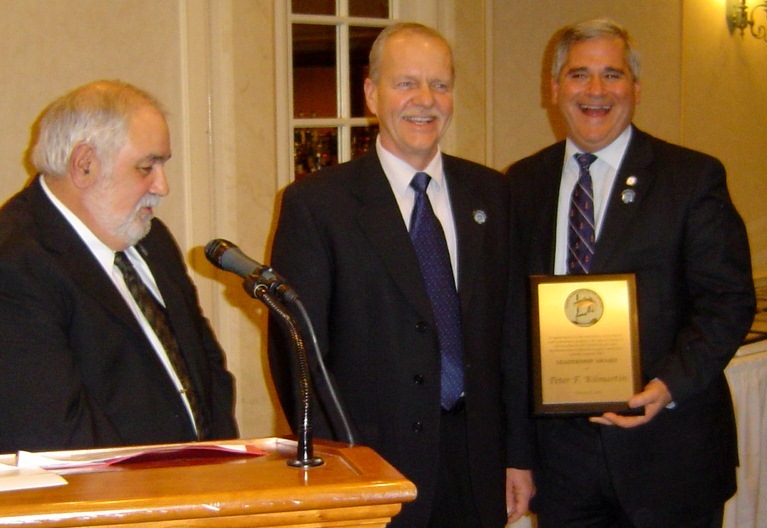 Public access advocate: RI Attorney General Peter Kilmartin (right) received a Leadership Award from RISAA at their annual banquet Saturday for his efforts to help prevent Misquamicut landowners from blocking shoreline access. Steve Medeiros (left), president and Rich Hittinger (center), vice president of RISAA presented the award. 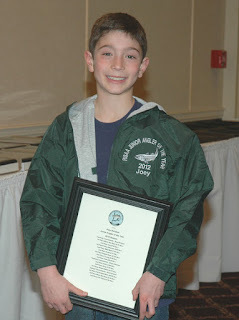 Joey Scrofani of Wakefield, RI was recognized as junior angler of the year Saturday by the Rhode Island Saltwater Anglers Association (RISAA). Joey shown with the award and jacket he received Saturday and with a black sea bass and scup he caught in a tournament last season. The Department of Environmental Management (DEM) announced that a limited number of new commercial fishing licenses will be made available this year. A total of 23 new quahog, 11 new soft-shell clam, and six new restricted finfish endorsements on commercial fishing licenses will be available for the 2013 fishing season. The new restricted finfish endorsements will allow for the commercial harvest of any of the six species of restricted finfish: summer flounder, scup, striped bass, black sea bass, tautog, and winter flounder. Applications for the new endorsements must be filed with DEM by February 28, 2013. The applications will be screened, and the new endorsements awarded, on the basis of the priority selection process set forth in the commercial licensing regulations. Rhode Island residents may also obtain, without limits or restrictions, new commercial fishing licenses with the following endorsements: shellfish other, non-restricted finfish, and non-lobster crustacean. Also, any resident aged 65 or older may obtain a 65 & Over Shellfish license, and any resident who is a full-time student and under the age of 23 as of February 28th of the license year may obtain a Student Shellfish license (both of which allow for the commercial harvest of quahogs). Applications for all new licenses must be filed with DEM by February 28, 2013. Interested applicants are encouraged to review all guidance documents and applications located at www.dem.ri.gov. Licenses may be renewed online through April 29 via DEM's website, www.dem.ri.gov. License holders are reminded that prior to license renewal, all logbooks must be up to date with DEM's Marine Fisheries Program located at 3 Fort Wetherill Road in Jamestown. For questions concerning the log books, call the Marine Fisheries office at 401-423-1926. In December, DEM’s Office of Boat Registration & Licensing mailed approximately 4,500 marine license renewal applications to all commercial marine license holders as well as those applicants holding recreational pot/diver licenses, vessel declarations, and marine dealer licenses. Questions regarding licenses or endorsements may be directed to the licensing office at 401-222-6647. The Rhode Island Saltwater Anglers Association (RISAA) held their 15th Anniversary Banquet Saturday at the West Valley Inn, West Warwick RI. Community fishing advocates were recognized at the event as well as anglers who were recognized as winners of their annual fishing tournament. Plaques for anglers in adult and junior categories in both boat and shore divisions were awarded for a variety of species such as fluke (summer flounder), striped bass, tautog and bluefish. 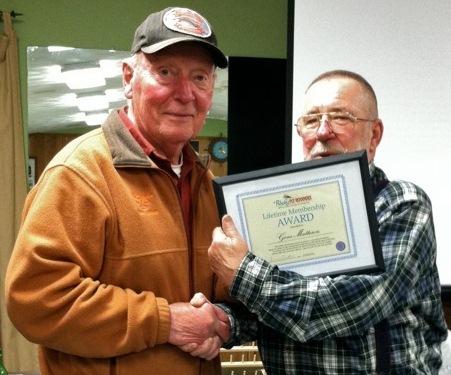 Charles Bradbury was awarded angler of the year posthumously. This was the fifth angler of the year award to Bradbury; his sons Michael and Raymond Bradbury received the award on his behalf. Others receiving awards included Joey Scrofani of Wakefield, RI who received the junior angler of the year award; RI Attorney General Peter Kilmartin and Alfred DiOrio, Professional Land Surveyors of Ashaway, RI, for their work in the area of public access to the shore; Larry Mouradjian, associate director of DEM’s Bureau of Natural Resources and Steve Wright, director of Parks and Recreation, Narragansett, RI for their work with the Galilee fishing tournament and seafood festival. In a move that has relieved recreational and commercial fishers, last week the Mid-Atlantic Fishery Management Council (MAFMC) approved an acceptable biological catch (ABC) limit of 5.5 million pounds for black sea bass for both 2013 and 2014. If approved the ABC would result in a recreational harvest limit of 2.26 million pounds and a commercial quota of 2.17 million pounds. Black sea bass have been managed with a 4.5 million pound constant catch level since 2010. The Council’s decision to increase the ABC was based on recommendations from its Scientific and Statistical Committee (SSC). Recreational fishermen often target and catch black sea bass as a by-catch when targeting other species. The recreational black sea bass fishery closed two months early last year after preliminary catch estimates indicated that the 1.32 million pound recreational harvest limit had been exceeded. This closure and the possibility of future quota reductions and/or closures sparked frustration among members of the recreational fishing community, many of whom felt that the overage was caused by an underestimation of the black sea bass stock size. The Council discussed this issue at the December 2012 meeting and requested that the SSC reconsider the 2013 ABC and develop a recommendation for 2014 in light of recent stock and landings information. The SSC met in January and initially concluded that the additional information relative to fishery performance, stock size, and recruitment were insufficient to justify an ABC adjustment for black sea bass. However, after evaluating the constant catch level that has been in place for three years, the SSC concluded that the 4.5 million pound ABC is “extremely conservative” and recommended an increase to 5.5 million pounds for the next two years. Fly Rodders land awards: Gene Matterson (left) a club advisor and board member of the Rhody Fly Rodders for over 20 years is given a ‘Lifetime Membership’ award by Armand Corchaine, club president. Dave Loren, past president and board member and John Pope who serves as secretary/treasurer of the club also received a Lifetime Membership award. An ‘Outstanding Service Award’ was given to retiring vice president, Jim Burden. Visit DEM’s web site at www.dem.ri.gov for additional information on all of these proposed amendments. Written comments may also be submitted in advance of the meeting by 12:00 p.m. on March 13, 2013 to the Division of Fish and Wildlife, 3 Fort Wetherill Road, Jamestown, RI 02835. As part of ongoing efforts encouraging children, families and individuals to enjoy the recreational resources and outdoor activities offered at our state parks and to increase levels of physical activity, the Department of Environmental Management will hold a series of free activities during February school vacation. On Wednesday, February 20, DEM Parks & Recreation staff will lead guided hikes and walks around Peck Pond and other trails in Pulaski Memorial Recreation Area in Glocester. Participants will able to explore beaver dams around Peck Pond and learn about trees native to Rhode Island. The hikes will take place on the hour at 10 a.m., 11 a.m. and 12 p.m. Hikers should meet at the warm-up hut/pavilion in the beach area. Also, feel free to bring your cross country skis, snow shoes or sleds to enjoy Pulaski’s groomed trails and snow-covered hills. On Thursday, February 21, the Department will offer tours of the Lafayette Fish Hatchery in North Kingstown. The tours will run continuously from 10 a.m. to 2 p.m. The Lafayette Fish Hatchery is one of three hatcheries where DEM raises fish until they are stocked in the state's waters. During the tours, personnel from DEM's Division of Fish and Wildlife will explain the functions and procedures of the Hatchery as well as the life stages of fish. For more information contact the Division of Parks and Recreation at 222-2632 or visit the website at www.dem.ri.gov. The Atlantic Menhaden advisory panel of the RI Marine Fisheries Council met last week to review stock status, 2012 performance and the Atlantic States Marine Fisheries Commission’s Amendment 2 and its impact on Rhode Island. DEM regulation recommendations as they pertain to Atlantic Menhaden were status quo compared to last year. One proposal was discussed and voted on at the AP meeting… to reduce the amount of fish required before commercial boats can return to fish after the fishery has been shut down. This proposal was moved to public hearing with a vote of non support from the Advisory Panel. DEM has one of the most advanced Atlantic Menhaden species management plans on the east coast that includes commercial vessel reporting before and after a vessel is fishing an area, weekly stock assessments via spotter plane and helicopter (counting schools of fish) and a management model that includes a static biomass threshold, a dynamic fishing cap based on stock assessments, vessel capacity regulations and a host of gear requirements. Atlantic Menhaden management plan recommendations from the AP will now move to public hearing on March 13 before the RI Marine Fisheries Council votes on recommendations that they will make to DEM director Janet Coit. What’s new at the Miami Boat Show? The Boat US newsletter and website had a good review of new items they saw this past weekend at the Miami International Boart Show, the largest show of its type in the world. Here a few items that caught my eye. Helm Master offers a revolutionary level of control, even in tight quarters for Yamaha and Mercury outboard motors. It not only makes docking easier, Helm Master also incorporates additional boat control functions, such as automatic trim, speed and automatic steering friction control. With Yamaha Engines, the new Helm Master system integrates multiple components. They include, but are not limited to, exclusive Helm Master Digital Steering Helm, Electronic Key Switch (EKS), digital remote control, electronic control units, steering cylinders and pumps, joystick and Command Link Plus® 6Y9 gauge. At the touch of a button, the system integrates all boat control devices while eliminating the need for bow thrusters in most boats. In addition, a user-selectable high mode allows the engines to operate at higher rpm for increased control when docking. Propane outboards. LEHR Corporation introduced their new propane outboard engines at the Miami Boat Show. LEHR relates on their website that they first ran propane outboards on research vessels in the North Sea. Captain Bernardo Jorge Herzer, CEO and founder of Lehr said, “Propane is just safer, more efficient and more reliable… that’s why we used it on our ships.” In addition to outboards LEHR makes propane trimmers and edges for lawn work, lawnmowers and leaf blowers. The outboards come in 9.9, 5 and 2.5 horsepower sizes. The 2.5 horsepower engine uses a standard 16.4 oz. (1 lb.) propane canister (like those small tanks commonly used with Coleman stoves). A tank of this size would last about 2.5 hrs and at top end the 2.5 horsepower engine runs at 3,000 to 3,500 RPMs. Visit LEHR a www.golehr.com . Sealegs amphibious vessels have three wheels that role down when on land. The Rigid Hull Inflatable (RHI) comes in 20 ft and 23 ft lengths (they also have a 23.5 ft cabin model). They cannot be built smaller due to the size and weight of the hydraulic equipment required to make the amphibian perform in various conditions. It is ideal for when vessels are stored nearby in a yard and you do not want to trailer the boat. Vessels travel about 10 mph on land and 30 to 35 mph on the water. Continuous use on land is limited to 10 minutes as Sealegs is driven hydraulically by an air-cooled motor under the seat. The air-cooled motor is a 24 horsepower Honda, 2 cylinder, 4 stroke which uses the same fuel tank as the outboard. Visit Sealegs at www.sealegs.com . All in the family. 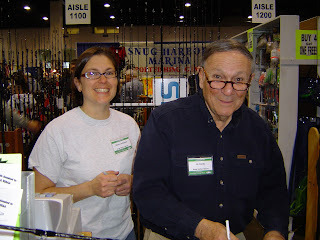 Elisa Jackman with her father Al Conti of Snug Harbor Marina, South Kingstown, RI will have a major presence at the New England Saltwater Fishing Show once again this year. The show will take place March 8-10. The Rhode Island Saltwater Anglers Association (RISAA) has increased the number of seminars, demonstrations and workshops to over 60 during their Friday, March 8th to Sunday, March 10th New England Fishing Show taking place at the RI Convention Center. 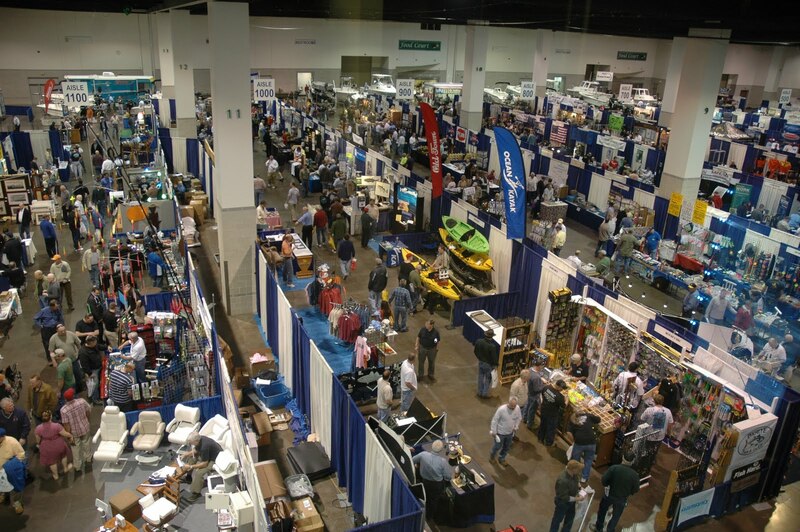 The show is the largest of its type in the Northeast with over 250 exhibitors including tackle, rods, reels, lures, electronics, charter guides, boats, motors, accessories, clothing and much more. The seminars will take place in four different locations… the “Main Stage”, a 200-seat area that will continue to present some of the top anglers on the East Coast; “Workshops” in a more personal 50-seat seminar area; a “Casting Lane”, to demonstrate surf casting and fly fishing; and a “Demo area” with no seats designed so anglers can see gear, products, and the speakers close up. “All four areas will be in continual operation during the weekend with seminars and demos running every hour.” said Steve Medeiros, RISAA president. Seminar topics presented by some of the best regional fishing guides and captains include fishing for daytime stripers by Capt. BJ Silvia and Greg Vespe; secrets for catching big tautog by Capt. Greg Meyers; Block Island stripers by Pete Vican and Don Smith; how and where to catch bigger fluke by Capt. Dave Monti; light tackle sharking by Capt. Bruce Macomber; and a host of other topics. Check topics, speakers, seminar times at www.risaa.org. Tickets for the show are $8.00 each online (minimum purchase of two tickets online) with a special $1 online discount coupon at www.nesaltwatershow.com , or you can call for advance tickets at 401.826.2121. Sunday is family day, all women and children 12 and under admitted free. Captain Eric Thomas, fishing guide for 25 years, will be the guest speaker at the Tuesday, February 19 Rhody Fly Rodders meeting at the Riverside Sportsman’s Club, East Providence. Captain Thomas will talk about how to land different hard-tail species including Atlantic Bonito, false albacore, skipjack tuna, and school bluefin tuna. He will concentrate on Atlantic Bonito and false albacore as they are the species that have consistently been showing up off coastal shores in recent years. Learn about the tackle he uses, for both fly and spinning rods, and the baitfish, flies, lures he uses as well as location, boat tactics, landing and releasing these super fast fish. The meeting will start with some fly tying at 6:30 p.m. and the presentation will start at 7:30 p.m. Monthly bucket raffles with free coffee and cookies. Bar refreshments are available. Directions to the Riverside Sportsman’s Club: from Providence take Rt. 195 east to Exit 7 Route 114. Travel south approx. 4 miles. Take left reversing direction at median entering Barrington just after WPRO Radio Station. Continue north for one mile; take right at Riverside Sportsman’s club sign on Mohawk Drive. There is a public hearing scheduled for Tuesday, February 19 to consider management plan recommendations on striped bass, spiny dogfish, sharks and lobster management plans. The hearing will take plans at 6:00 p.m. in the URI Bay Campus Corless Auditorium, South Ferry Road, Narragansett, RI. Check AP and public hearing details at www.dem.ri.gov. The process for regulation recommendations includes input and discussion at the species advisory panels, then on to a public hearing for comment (usually several species considered at the same meeting), and then recommendations move to the RIMFC for consideration. The Council takes formal votes on recommendations and passes them on to DEM director Janet Coit for consideration. The next RIMFC meeting to discuss AP and public hearing recommendations is scheduled for March 4, 2013. A RISAA seminar will be held Monday, February 28, 7:00 p.m. at the West Valley Inn, 4 Blossom Street, West Warwick, RI. Topics to include a presentation of sea disasters by Michael Tougias author of “A Storm Too Soon”, which tells the story of a storm with 70’ waves. "... I like to transport the audience into the heart of the storm so that they ask themselves 'what would I have done?’… I enjoy doing these programs.” said Tougias. The second topic for the evening will be on Fishing Safety with Dr. Craig Pruitt who will speak on health for boaters and fishermen, a subject he knows well as he is an avid outdoorsman himself. Dinner served by West Valley Inn between 5:30 p.m. and 6:30 p.m. Public is invited to attend with a $10 donation to the scholarship fund, RISAA members no charge. Cost of dinner is separate.